Has Bond finally given in to the charms of Moneypenny? Sunday 26th May we had a show stand at Beautiful Dartington Hall for a wedding open day (the main show is in April and not to be missed). This was a smaller gathering showing off the magnificent great hall with a few invited wedding suppliers displaying a variety of great ideas for that special day. We had Meryl the Morris Minor on display outside and a show stand inside. I got talking to a chap who came over to our stand. He told me he had a classic car and that he had chauffeured a few weddings just for friends, perhaps I would I be interested in taking his car on as part of our wedding car business? I had no idea what to expect, these conversations often end with a Morris Marina. But this time Andrew handed me a photo of his breathtaking DB5. Well I didn’t take much persuading! 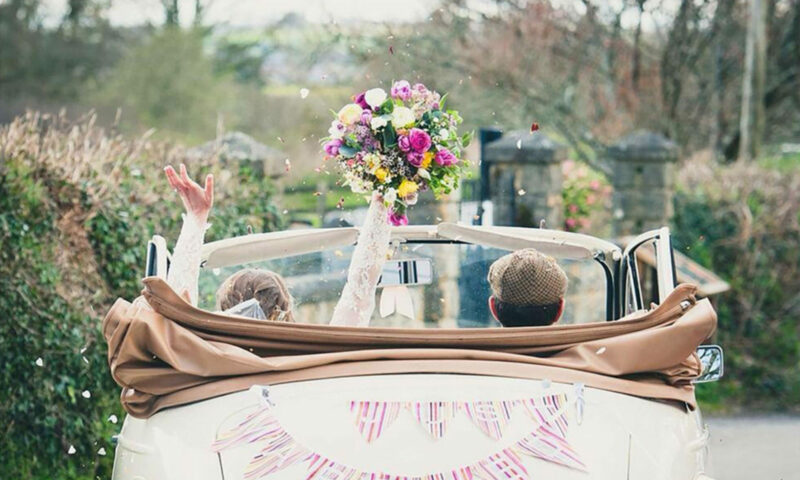 We are delighted to include this magnificent classic as part of our wedding fleet. 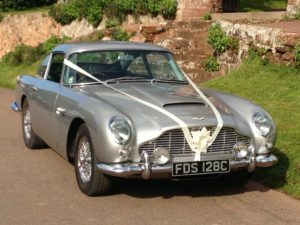 Now we really can offer everything from the nostalgic fun of a Morris Minor, the graceful opulence of a classic Rolls Royce and the iconic James Bond Aston Martin DB5. So now you really can make your great day a classic. Give us call on 07918715039 anytime and we can help plan that special wedding transport. Previous PostPrevious Zodiac is the star of the show!